Ah, the cocktail arcade cabinet. With the right design, its able to blend right in to any living room decor, much more than any traditional stand-up cabinet, at least. 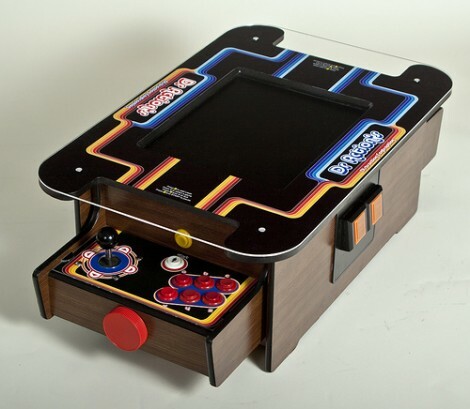 [graham] over on Instructables didn’t tear apart a 30-year-old arcade cabinet for his new coffee table. Instead, he built one from scratch, connected it to a Rasberry Pi, and brought hundreds of arcade classics right in front of his couch. The build began by cutting up some wood to house the 24″ LCD screen, Raspi, and arcade controls. The LCD screen is supported with a rather clever system of cross braces screwed into the VESA mount, and of course a piece of perspex protects the screen from the inevitable spills and scratches. The joystick two blue ‘player’ buttons and the player 1 and player two buttons are wired directly to the GPIO pins of the Raspberry Pi. The Raspi boots up into a selection of MAME games, but there’s also an option for opening up the window manager and browsing the web. It’s a very neat build that’s a lot smaller (and easier to build) than a traditional cocktail cabinet. As [graham] is using it for a coffee table, it might get more use than a regular MAME build, to boot. 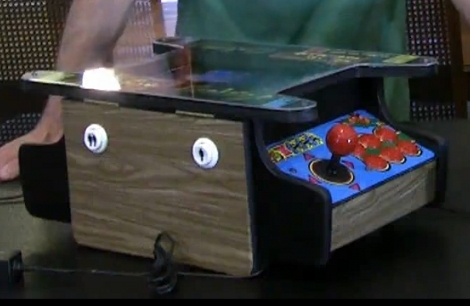 At a glance you might think it’s the real thing, but if you look closer you’ll see that The Distraction Contraption is an extremely well-executed cocktail cabinet recreation that hosts a MAME setup. [Sam Freeman] took pictures of the entire build process and has posted them, along with captions, as a Flickr collection. The project started after some inspiration from this diminutive cocktail cabinet. He wanted his own version that was closer in scale to the coin-op versions that would have been found in bars a few decades ago. He designed the case to fit a 17″ LCD screen using Google Sketchup. From there, he cut out the parts and routed the edges. The controls feature buttons and joysticks, as you’d expect, but that red cap on the end works as a spinner. He tried out a few different ideas for this auxiliary control. He found that using LEGO gears to map the spinner’s motion to the axle of a mouse worked best. To give the plastic knob a better feel he loaded it with pennies to increase the mass, bringing momentum into play. The final look was achieved using wood-grain contact paper, and custom printed skins.